The e-commerce payment cooperation is intended to help the Gentile dethrone the US dollar as the world’s primary reserve currency. This is the relationship between China and Russia which is at its zenith at this point in time. It is a relationship that covers the entire gamut from finance, energy and agriculture to military and security ties and to close coordination on regional and global political issues. The leaders of the two countries, Xi Jinping and Vladimir Putin, who have forged a strong inter-personal bond, approved in July 2017 the 2017-20 implementation outline for the Treaty of Good Neighbourliness and Friendly Cooperation between China and Russia. This ever strengthening bond between the world’s most populous nation and its biggest geographical entity will not only hasten the demise of US hegemony but will also accelerate the emergence of a multi-polar global order. 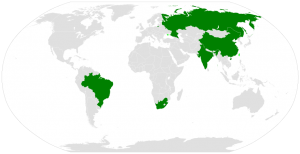 A number of other states are already linked to China and Russia through BRICS and the Shanghai Cooperation Organisation. 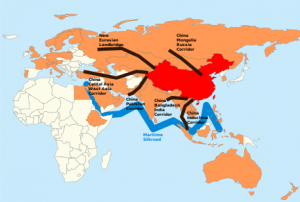 “It encompasses areas of security and economics and is also China’s challenge to US hegemony. If you look at the maps at the beginning of this post, you will see that pretty much all of Asia, Australia/New Zealand, and Europe, as well as parts of South America and Africa are involved in these international projects/organizations. Part of the objective of the BRICS, EAEU, SCO, EU, and Silk Road arrangements is to establish a new world order (SCO, EAEU, and BRICS defining a ‘new world order’? 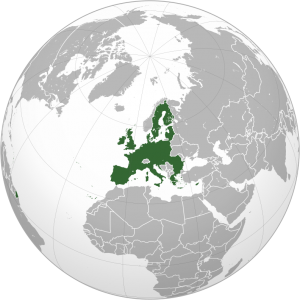 )–an order no longer dominated by the USA and its Anglo-Saxon allies, like the UK. And as far as Australia and New Zealand go, they will be ‘swallowed up’ in a sense by one or more Gentile powers–this will happen during the Great Tribulation (Matthew 24:21; Daniel 8:24-25), which is when the USA will be conquered (Daniel 11:39; see also USA in Prophecy: The Strongest Fortresses). As far as the European Union goes, it is upset that the UK is leaving it, is upset with US President Trump, it is threatening actions against the USA for intended sanctions against Russia (see Brussels to act ‘within days’ if US sanctions hurt EU trade with Russia – internal memo), and it would like to cooperate more with the Eurasian Economic Union. So, a coordination of Gentile powers against the Anglo-Americans is occurring. So, we see that Gentiles will consume Jacob/Israel. The descendants of which have been the dominant peoples in the USA, UK, Canada, Australia, and New Zealand (see also Anglo – America in Prophecy & the Lost Tribes of Israel). Notice that Jeremiah, Ezekiel, Jesus (whose words are recorded in Luke), and John (who penned Revelation) were talking about the same time. Also notice that “it is the time of Jacob’s trouble” and that the “Gentiles” are dominating. This means those that are descended from Israel or have the name of Jacob (cf. Genesis 48:14-16) will be mainly the ones who are trampled on. One of the peoples that God says He will use to punish the descendants of Israel, Assyria (Isaiah 10:5-11), are a Gentile people–they will normally lead during the time of the Gentiles. This will be a terrible time. In Jesus’ prophecy in Matthew 24, He was answering the question about the TIME of the end of the world, and the second coming of Christ to rule the world. It is the common assumption that the times of the Gentiles are a period of blessing on the nations. It is argued that since God took away the blessing of being great and dominant nations from Israel and Judah and since the Gentiles for centuries have been dominant nations, that human rule is a blessing bestowed upon the Gentiles. Then again, many claim that the times of the Gentiles are synonymous with the times of Judah’s punishment, that the Gentile times have already ended-some say in 1914, others say in 1917 or 1936. Some even think that it might end this year. But all these supposed dates for the ending of the times of the Gentiles are mere guesses! The truth is that almost no one really knows what the times of the Gentiles are. And yet without an understanding of the meaning of this prophetic period, you can not grasp the real significance of present day world-shaking events or understand what’s going to happen in the next twenty-five years. Let’s not assume, let’s study the Bible itself to see what these times really are. Israel was promised great national blessings, including national greatness if they would obey God. But God also promised that if they obstinately refused to obey Him, if they refused to follow His laws and let Him rule their lives, then He would punish them for a period called seven times (Lev. 26). The Bible itself defines this period of seven times for us. If you turn to Revelation the twelfth chapter, and compare verses 6 and 14 you will see that the word time in prophecy simply means a year, hence seven times would be seven years or 2520 days. Now let’s notice another key. In Numbers 14:34, God said Israel would bear their iniquities in the wilderness after the number of days they searched the land of Canaan, forty days, each day for a year. Then seven times or 2520 prophetic days would equal 2520 literal years! This period of seven times or 2520 years punishment did come upon Israel because they went their own ways and would no: submit to the rule of God. Israel went into captivity about 721 B.C. and did not become a great people again until their times of punishment ceased about 1800 A.D. At that time the descendants of the ancient House of Israel -America and Britain and the democratic peoples of the world–began to rise to such wealth and power as the world has never enjoyed before all because of the promises made to Abraham. Also Palestine, after a punishment against the House of Judah, that began about 604 R.C., was brought back from the Gentile Turks in 1917-exactly 2520 years later, when it came under the control of Great Britain, and finally the Jews. The seven times of Israel’s punishment was a period of great privation and suffering, of slavery and war because they would not submit their wills and their ways to God, because they would not allow Him to rule their lives by His perfect laws, which could have brought them peace and prosperity and dominion. Now that we understand the seven times punishment on Israel, let’s understand the meaning of the times of the Gentiles. The original prophecy to which Jesus had reference is found in the fourth chapter of Daniel. Jesus understood that this prophetic vision of the great tree had reference to the times of the Gcntiles as well as to Nebuchadneztar’s literal punishment. God was dealing with the Gentiles in Daniel’s day. The Gentile king Nebuchadnezzar had been sinning — living contrary to God’s law. He had been taking his people on the road to world conquest and the enslavement of other nations and peoples. He had been traveling the way of war, not of peace. God had sent His warning. The king did not heed. So God punished the nation seven years (569 to 562 D.C.) by cursing King Nebuchadnezzar with madness — till he acted and thought like a beast of the forest! No punishment like that had ever come on any king before! No nation had ever been so cursed! After these seven years Nebuchadnezzar’s mind returned to sanity. He now repented, admitted that his ways were wrong, and actually wrote a great public document admitting before all nations what had happened to him and to his people! Interestingly, there are 2520 days in 7 years of 360 days. Hence, that also seems to point to the length of time the seven-year ‘peace deal’ of Daniel 9:27 will be confirmed for. But it is only for 1/2 that time (42 months) that the Gentiles “will tread the holy city” of Jerusalem (Revelation 11:2). Then Jesus, the Prince of Peace (Isaiah 9:6), will return and destroy the predominantly Gentile powers that will be united to fight against Him (Revelation 19:19-21). The Great Tribulation itself is further described in Revelation 6:9-11 (the fifth seal, that seems to occur because the faithful church has suffered martyrdom, cf. Daniel 11:31-35; Matthew 24:9-10), Lamentations, Daniel, and other parts of the Bible. It starts with Matthew 24:21 and Daniel 11:39. Some would call this World War III (WWIII; see also World War III: Steps in Progress and/or watch Is World War III About to Begin? Can You Escape?). Notice that the above passage mentions Assyria, which is who God will use to punish certain descendants of Israel, such as the U.S.A., etc. (see also Anglo – America in Prophecy & the Lost Tribes of Israel). North America would clearly include the USA and Canada. Since Zachary is discussing the dominion of the first born son of perdition (cf. 2 Thessalonians 2:3-12), the above is clearly teaching that this would happen at the start of the Great Tribulation. This is consistent with the understanding of the Philadelphian remnant of the Church of God on these matters (though we do not believe that God inspired this Zachary). Anyway, for the final time of the Gentiles to arise, the Gentiles will need to cooperate together against the USA and its Anglo-Saxon descended allies. The BRICS, EAEU, SCO, EU, and Silk Road arrangements are all intended to do that and are all taking steps which align with properly understood biblical prophecies. A block of nations from North Africa and the Middle East will also be involved (cf. Daniel 11:27, 40-43)–this is something that US President Donald Trump and others have encouraged (see How Will Middle East Peace be Brought About?). This entry was posted on Wednesday, July 26th, 2017 at 7:00 am	and is filed under Prophecy. Putin: Leader of the Eurasian Union?